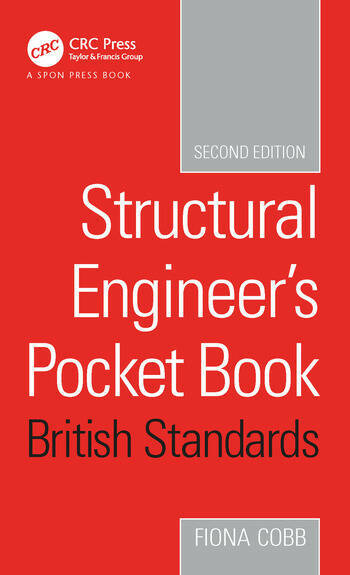 The Structural Engineer's Pocket Book British Standards Edition is the only compilation of all tables, data, facts and formulae needed for scheme design to British Standards by structural engineers in a handy-sized format. Bringing together data from many sources into a compact, affordable pocketbook, it saves valuable time spent tracking down information needed regularly. This second edition is a companion to the more recent Eurocode third edition. Although small in size, this book contains the facts and figures needed for preliminary design whether in the office or on-site. Based on UK conventions, it is split into 14 sections including geotechnics, structural steel, reinforced concrete, masonry and timber, and includes a section on sustainability covering general concepts, materials, actions and targets for structural engineers. Fiona Cobb is a Consulting Engineer with Price & Myers in the UK. She was awarded the ACE Young Consultant of the Year in 2007.